One of the most original, prolific and energy-packed rockabilly acts to ever set a stage or recording studio afire, Larry and Lorrie Collins were born in Oklahoma and raised behind the microphones of Compton, California's legendary Town Hall Party country variety show. At various times televised and broadcast on the radio, the atmosphere of Town Hall Party (later syndicated as Ranch Party) was positively electric; laid back host Tex Ritter being the perfect foil for the high-octane hillbilly of house band leader Joe Maphis and the revved-up countrified rock 'n' roll of Wanda Jackson, two prime influences on the Collins Kids sound. Double-neck custom guitar wizard Maphis—and in fact, the whole Town Hall Party ouvre—personified West Coast hillbilly music during the '50s: Nashville may have been edging towards a slicker sound, but, fuelled by the musical experimentation of western swing and west coast R&B, a booming economy thanks to the defense plants, the glitz and glamour of Hollywood and the most important ingredient, thousands of displaced Oakies, California had a style all its own. Buck Owens and Merle Haggard would eventually build upon parts of it and emerge with the Bakersfield sound of the '60s, but throughout the '50s it still meant lightning-fast, jazz-inflected guitarists like Jimmy Bryant and Roy Lanham, unsung six string pioneers like Jimmie Rivers and world class steel men such as Speedy West. Conveniently, guitar builders like Leo Fender and Semi Mosley had set up shop on the West Coast, and one day, on the Town Hall Party stage, Mosley presented Maphis with a double-neck Mosrite complete with his name inlaid in the neck. Maphis had recently taken Larry under his wing, and had Moseley build one for his young protégé. With their matching double-necks, the two were off and running, displaying a stunning synergy on instrumentals like "The Rockin' Gypsy," "Early American," and "Hurricane," all of which pre-figured the surf guitar style by a number of years. 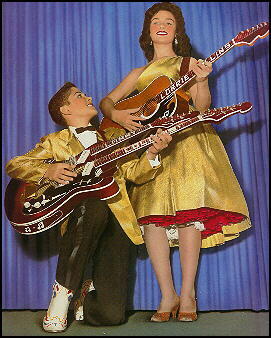 Larry's guitar work was also the anchor of the Collins Kids sound, which was truly multi-faceted. Signed to Columbia Records in 1955, songs like "Party," "Hop, Skip and Jump," "Hoy Hoy" and the unreleased "Hot Rod" featured their irresistible harmonies, while their twelfth single coupled Larry's frantic "Whistlebait" with Lorrie's slow-burning "Rock Boppin' Baby." Barely sixteen when she recorded it, Lorrie's torchy performance resonated with an unmistakable teen sexuality, sparking controversy while simultaneously becoming a rockabilly classic. After getting married in 1959, Lorrie retired in 1961 at the age of nineteen following the birth of her first child. Short of the occasional late '60s appearance on the Jackie Gleason Show, the Collins Kids remained silent until they reunited to much acclaim in 1993. By that time Larry had become a successful producer and writer, penning country classics like "Delta Dawn" and "You're The Reason God Made Oklahoma."